The English East India Company was one of the most powerful and enduring organizations in history. Between Monopoly and Free Trade locates the source of that success in the innovative policy by which the Company's Court of Directors granted employees the right to pursue their own commercial interests while in the firm's employ. 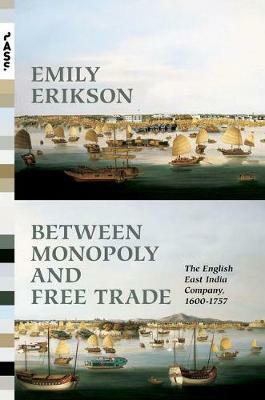 Exploring trade network dynamics, decision-making processes, and ports and organizational context, Emily Erikson demonstrates why the English East India Company was a dominant force in the expansion of trade between Europe and Asia, and she sheds light on the related problems of why England experienced rapid economic development and how the relationship between Europe and Asia shifted in the eighteenth and nineteenth centuries. Though the Company held a monopoly on English overseas trade to Asia, the Court of Directors extended the right to trade in Asia to their employees, creating an unusual situation in which employees worked both for themselves and for the Company as overseas merchants. Building on the organizational infrastructure of the Company and the sophisticated commercial institutions of the markets of the East, employees constructed a cohesive internal network of peer communications that directed English trading ships during their voyages. This network integrated Company operations, encouraged innovation, and increased the Company's flexibility, adaptability, and responsiveness to local circumstance. Between Monopoly and Free Trade highlights the dynamic potential of social networks in the early modern era.